On December 11, 2015, a first-hand report of the Climate Change Summit (COP21) was provided in Miami during a special evening at Global Ties Miami. During the discussion that followed this presentation by Consul general, Philippe Létrilliart, the panelists provided info regarding the impacts of the climate change on local communities and discussed the actions taken by South Florida to address the climate issue. Green-night - CLIMATE CHANGE: What lies ahead? Panel discussion- A first-hand report of the Climate Change Summit (COP21): What are the impacts on local communities and how does South Florida address the climate issue? Background: Global surface temperature is rising. It will probably be 1.5 °C higher at the end of the century compared with the pre-industrial era (1850-1900). Biodiversity, coastal regions, the oceans, health and even our cultural heritage are affected by the impacts of climate change. This was the essential message of the 5th report of the Intergovernmental Panel on Climate Change (IPCC) published in 2014. Local impacts and local actions: Thanks to the participation of the Consul general of France, Professors and local leaders, the objective of this evening focusing on climate change is to discuss the impacts of the COP21 negotiations in South Florida and the involvement of the local communities. The discussion was open by Consul general, Philippe Létrilliart, who provided a report of the diplomatic negotiations that took place in Paris. 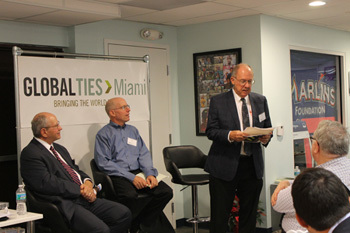 The panel was moderated by Joseph B. Treaster, Professor at the University of Miami.